_Located in the rural and mountainous Central Plateau of Haiti, Ti Peligre is a farming community that is surrounded by the Thomonde River. Throughout the year, the 1000 inhabitants of Ti Peligre rely on their ability to cross the river to gain access to their basic needs which include: selling local goods in neighboring market towns such as Casse, accessing medical care at Zanmi Lasante (Partners in Health) in the town of Cange, and gaining access to education beyond the 4th grade. 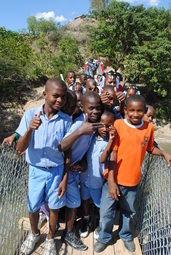 Until the bridge was constructed, rain isolated Ti Peligre from these basic needs for up to 6 months out of the year. The Ti Peligre bridge project was initiated by Virginia Tech accounting professor Bryan Cloyd , who is a partner and sponsor for the construction of the elementary school in the village. Professor Cloyd collaborated with a team of several Virginia Tech Civil Engineering students who helped design and construct the footbridge from November 2009 to March 2011. Inspired by the mission and impact of Bridges to Prosperity, the students involved in the project formed a sustainable student chapter of Bridges to Prosperity at Virginia Tech (B2PVT) that consists of undergraduate students, graduate students, and faculty advisers. The project in Ti Peligre is B2PVT’s first footbridge project and is a product of contributions from many partnerships. Individuals in Blacksburg, Virginia, and supporting organizations at Virginia Tech gave financial and technical support. The cable was donated by B2P. Materials were shipped by Partners in Health. In addition, countless Haitians volunteered their time and energy to make the construction of this bridge possible, including: Leneus Joseph, pastor of the Baptist church in Cange; James Paul, a Haitian Civil Engineering student; and many local Haitian leaders. B2PVT is excited about continuing bridge projects Haiti and helping Bridges to Prosperity bridge the gap to world prosperity.